– and notify them of delays by email or SMS. to make changes without the need to contact you. can transform how you manage logistics. We integrate with all your couriers, so you'll never have to integrate with another courier again. ParcelVision integrates with all major UK couriers, so once you've integrated with ParcelVision, you'll won't need to integrate with any other courier again. No matter how many couriers you use, you're staff and customers will have one platform to track and manage deliveries. I Love It, Tell me more! Our tracking widget empowers your customers to make 'in-flight' changes such as re-scheduling the delivery date. Over 70% of customers want to self-serve. They don't want to spend time in a call centre queue. It's a win win for a retailer to, reduced call volume, improved resolution time and customer satisfaction. Our tracking widget doesn't just display tracking information, it also advises customers what each scan means, and what's required to resolve any delays. However we even go further than that, your customers can also make in-flight changes such as amending the delivery date, or arranging to collect from a local store. Send pro-active tracking updates via e-mail and SMS, and update carriers of new customer instructions without any human intervention. Currently when a shipment is delayed, most retailers wait for a courier to resolve it (Which can take days or not happen at all) or for their diss-satisfied customer to contact them when their order is not received. ParcelVision puts you back in control. When a delay occurs, ParcelVision understands what's required to resolve it. If a delay is due to a customer error, an automated alert is triggered advising your customer the steps they need to take to resolve the delay. If additional information is required, such as updated address information, ParcelVision enables your customer to update that information, and then automatically sends it to your courier, without any human intervention. 2 Use our API to send us your order information. 3 You're done! We'll update the latest scans for every shipment you send. 2. Embed our tracking widget on your site. 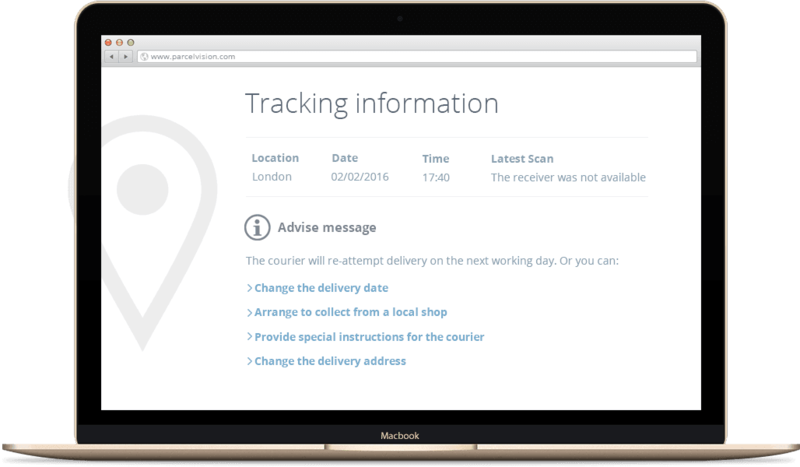 ParcelVision updates real-time scan information for all your couriers throughout the day, so you can request status updates anytime via our API. When a shipments delayed, we can also return advise messages for each type of scan event. Embedding our tracking widget on your site is the best way to utilise our technology. When a customer requests an order tracking update, by rendering our widget, your customer will be able to see the latest scan, and make any in-flight changes they want, such as re-scheduling the delivery date. If you can't embed our tracking widget due to compliance reasons, you can direct your customer to our tracking page. You can configure the page format, and add your logo. a happier customer and lower costs for you. Not all delays are the couriers fault, but they all need resolution. The speed and efficiency with which you do so can be the difference between a satisfied customer and and ex customer. Your customer notifies you when they don't recieve their order. Your agent then needs to contact the courier, establish the action points required to resolve the delay, then obtain updated information from your customer and pass it over to the courier. It's a lot of human interaction, which often leads to delays and a frustrated customer. It proactively emails your customer to notify them of delays and advises them how to resolve the delay. And if human interaction is required, ParcelVision integrates directly with your CRM, creates a ticket and assigns it directly to one of your agents. ParcelVision enables you to outsources the management of your entire delivery workflows, and it works straight out of the box. Imagine this; a courier attempts delivery but your customer is not home. Your customer is notified by email and SMS. After clicking the embedded link, they're taken to a webpage where they choose to change the delivery address, which is then automatically relayed to the courier without any manual intervention. Welcome to the future of delivery. Welcome to ParcelVision. ParcelVision makes it so easy for your customer to make changes to their deliveries. Not only can they make changes via our tracking widget, for some types of delays its easier still, your customer can simply reply to a text in order to perform specific actions such as changing the delivery date. But ParcelVision doesn't just make it easier for your customers, it also reduced the burden on your support staff, because it does not just send updated details to the courier, it asks them to acknowledge the new instructions. And it then monitors the delivery to ensure everything goes according to plan, and if doesn't, it proactively chases for updates. If delays are not resolved and delivery does not occur within the time specified by you, then a CRM ticket is automatically created for your agents to follow up and resolve. It's this end-to-end automation that makes ParcelVision different from anything else on the market. We host on both Azure and Amazon for complete redundancy. Our platform is always up and always on, even when we are deploying updates. We back that up with a guaranteed 100% uptime SLA. Our micro-service based architecture is developed using the latest technologies including Microsoft Service Fabric. What this means is instead of having one big database, we have separate stand-alone engine's for each part of our technology, which not only makes our platform extremely fast and eficient, but also makes it much easier for us to make changes and improvements. Because we handle a lot of data, we built ParcelVision from the ground up, with security and compliance at the heart of our platform. All data is held in a secure, PCI Compliant environment and our infrastructure is also protected by Cloudflare, we also exceed DPA Compliance. catagories, carrier, customer, receiver and force mejeure. ParcelVision catagorise's every single courier scan, and then reports on the number of shipments delayed in each category. Our flexible reporting mechanism enables you to build and save your own reports, and even control the format, and column order. ParcelVision is a complete shipping solution, it doesn't just help you resolve delays once they occur, it also helps you understand the root causes. Understanding what types of delays are affecting delivery performance is the first step to improving your logistics. Are most delays caused due to incorrect addresses? Or is it a particular courier or delivery country that's causing the most issues. ParcelVision's insights make it easy to identify issues that are easily resolved or improved. For example if you find a large number of orders are delayed due to address issues, you may decide to add a postcode lookup tool on your checkout page. ParcelVision helps present data in a simple, easy to understand format, that makes it easy to find actionable insights that will transform your approach to logistics.